Wow that’s a little one. But it is not just any pillow inspired by a phrase on The Office, it has a pocket sewn on the back so I can stash who knows what since I have a terrible memory and will probably unintentionally hide stuff from myself! Anyway, I had leftover fabric from my torn pants (Upcycled Halloween Wreath, so I decided to make a little pillow for my sofa. 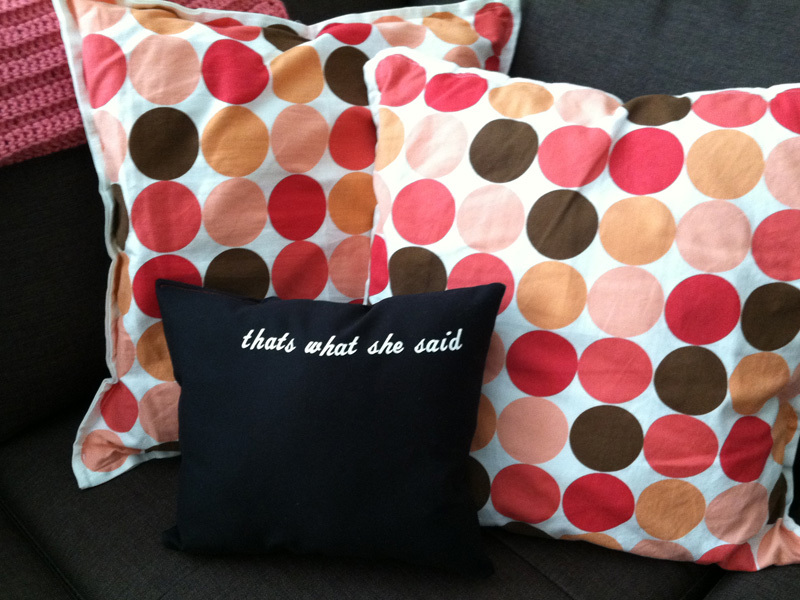 Since I love felt, iron-on letters (of course, I’d love a fancy Silhouette Cameo so I can cut fabric, vinyl and more but that’s $300 I wouldn’t be saving toward my kitchen remodel) I decided to add a little phrase to the front of the pillow – that’s what she said. Those polka dot pillows are the ones I made from fabric napkins in 2007. Thanks Emmy! I like to make stuff that reflects my interests, which is a little off-beat compared to some of the other craft blog projects and that’s okay! Thanks! I chuckle when I think of this pillow! Add stylish fun to any room with our roomy Throw Pillow. It measures a sprawling 18″ X 18″ with an 11″ X 11″ image area so you can lounge in comfort. It’s made of ultra-soft brushed twill with a sturdy canvas image area. Ships with pillow insert. Removable zippered cover for easy laundering.